← Unexpected Moments of Beauty, Expression, and Meaning? In visiting the Tamayo Museum today, on an amazing Mexican Sunday full of sunshine, families, and endless possibilities, the same could be said of Francis Aly’s exhibit. Often many people see Art as an end, the ultimate source of creative expression. In seeing Francis Alys’ exhibit, one realizes, this is just the beginning. In seeing his exhibits, Reel-Unreel, Tornado, (A Story of Deception) and Don’t Cross the Bridge Before You Get to the River, it is true, a broader sense of reflection and opinion rests in what normally would be a resting spot of expression. I often like to attend museums and take it all on and I usually end up thinking and forming an opinion about half of what I had seen. It was interesting to delve into the exhibits and not leave until a formation of realization set in. How does one do this? Simply by examining word for word the accompanying texts provided, the background setting of the individual works, being exposed to the accompanying films, literally immersing oneself into any underlying messages that might not be evident on surface. As we enter the last week of Summer Camp at ASF, our past themes of Our Cultures, Our City, and Being an Author push us to test the limits of understanding and knowledge in this final week of Being an Artist. Yes, there is a separate course titled Art at ASF. Yet, one realizes through exhibits as this that the art of expression lies in the availability to often present information on a higher level than the students that are exposed to various art. In doing so the expression that is revealed through another form, say writing and reading, remains another form that is shaken out from a higher level of information. If there is one thing I have learned from ASF Summer Camp, is the connection to teaching on a higher level than necessary produces some extraordinary results, and the attendees of ASF Summer Camp have been the exceptional example. In the course of three weeks have created their own novels for NanoWrimo, gone on to explore and rediscover sounds that make up their city they often take for granted, and recognize the characteristics of other cultures that define their similarities and differences. In Delaware, as an educator, students believed in my new approach of taking art and using art to enhance, motivate, and generate writing and expression. They took what we learned in the classroom and created grants, projects, and community outreach programs that occurred outside the classroom. As a result they accumulated awards from every facet of the word outside the classroom, grants to pursue extensions of their learning, recognition from the Governors of Delaware for four years, as well as success in being entrepreneurs to carry them into the furthest reaches on their education beyond high school. Awards became the incentive, but a deeper meaning than awards emerged. Going even further back, as an educator learning the ropes in the classroom, as an individual I learned so much from dipping into as many diverse situations as possible with educators from many diverse backgrounds – The National Writing Project, The Clarice-Smith Institute, The Reynolds Journalism Institute, an intern with the Pittsburgh Pirates, studying the Holocaust at the University of Delaware, even the AP Institutes I attended on the Eastern Shore enhanced how I saw WHAT could be brought to students, and I am so much the better for those experiences. Being able to put yourself out on a limb and push boundaries, I have found these are the role modeling students need to see and witness to be able to accurately navigate the waters of a changing world. I am grateful for being able to have some amazing colleagues, amazing students, and amazing experiences, often many that were unpaid and that were priceless, that helped shape a youthful creativity that goes beyond the restrictive guidelines of what defines how many see a typical teacher. 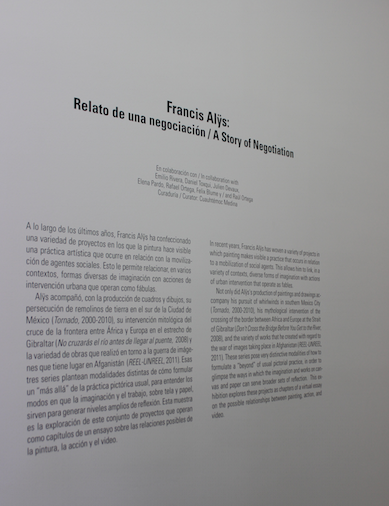 Francis Alys’ exhibit goes deeper than skin deep then you get the advantage of dipping into several artists that define variations of Latin American voices that changed how individuals see art as well follow Alys’ exhibit – again, expressions that bend how we see life in general. As I left the Tamayo Museum, I appreciate the one exhibit that entailed a single paint can that allowed two differing colors of paints to trail from the wall, to the floor to the outside of the Tamayo. I loved the fact that as I followed the paint trail down the outside stairs, to the sidewalk, outside the park, how oblivious the average person was to what I was following. No one that was unaware of this exhibit would have any reason to see the parallel lines of paint at their feet and yet, there was a metaphor here. I marvelled at how often we have some unusual, unique experience right in front of that often can shape how we see the things around us, and fail to act on it. Our job as educators? – escape the mundane and latch onto the views that hover right outside our streams of consciousness, that is the new level of education and experience, not degrees, not the selfishness of having a good time and maintaining the normal curriculum, but taking these and pushing the boundaries for ourselves and for students to learn the same lesson. Hence, the difference between a teacher and an educator. Respecting Francis Alys and his delving into issues of immigration, diaspora, Afghanistan and the affects on its children, expression, and art, the conceptions we have of everyday occurrences (Seeing Alys literally dive INTO a Mexican tornado – the hair stood up on my whole body!) – and so much more – it would be worth seeing this exhibit on a variety of levels. I am excited to explore the many more countless experiences that await me this summer to grow as a librarian, a Media Specialist, an educator, and as a person. This entry was posted in Uncategorized and tagged ASF Summer Camp, Clarice Smith Institute, Delaware Governor's Award, Don't Cross the Bridge Before You Get to the River, Endless Mountains Writing Project, Francis Alys, NANOWRIMO, Reel-Unreel, Repentino. magazine, Tamayo Museum, The Reynolds Journalism Institute, Tornado. Bookmark the permalink.